The classic witch fingers cookies get a healthy, gluten free, paleo AND vegan makeover! 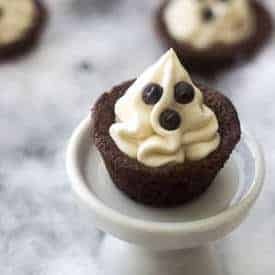 They’re easy to make and always a hit at Halloween parties! I mean, it’s my most favoritest holiday of the year EVER. Well, besides Christmas (mostly because of the ability to eat healthy ginger snaps.) Whatever. You get it. I just really love Halloween. And you know what I also L-O-V-EEEEE? HEALTHY, Paleo Halloween treats! Not the ones that come in a pillow case (did you guys use those to trick-or-treat? Or were my parents just parentals from the BLOCK? Ie: Ghetto fabulous) that your maybe-equally-ghetto-fab parents need to make sure aren’t going to KILL YOU. ANYWAY. 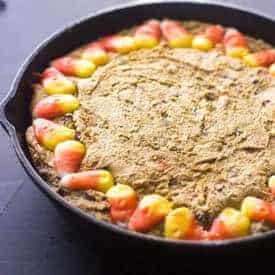 I’m teaming up with another awesome group of bloggers: Lindsay from “Cotter Crunch”, and Erin from “Texanerin Baking” to bring to your healthy-but-OH-SO-spooky-treat loving faces a roundup of Paleo Halloween Treats!!!! <— !!!. Lindsay has some Bloody Deviled Eggs! Deviled eggs made to look like blood shot eyeballs! All you need are green olives, spices, eggs, and your favorite paleo condiment to mix in! 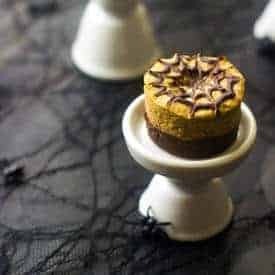 A favorite spooky appetizer for the kids (and adults) at Halloween parties, but also easy to make and healthy! 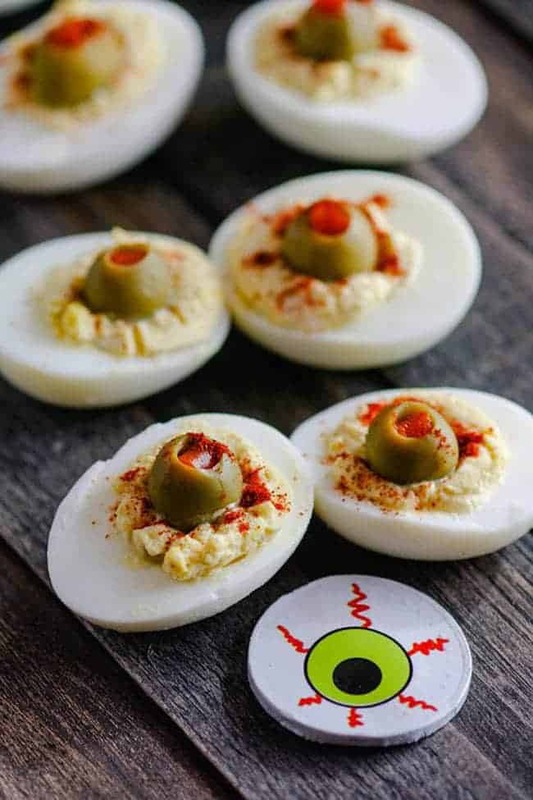 Get the recipe by clicking —> Bloody Deviled Egg. If you follow me on Instagram, you KNEW these witch fingers were coming. Like, in August. Because I should tattoo “Hi peeps, my name is Taylor and I am a crazy in-advance-work-a-holic person.” TRUE FACT. I also just really love Halloween. Combined with I work too much. #thisismyreallife. I promise we’re going to actually talk about these classic Halloween Paleo cookies right now. Except, we do need to BACK ‘ER UP the word “classic.” I sort of-totally-do feel like I’m just THROWING that word out to make you think that my parents weren’t totally lame with the pillow case shenanigans, and gave me SOME cool Halloween-age growing up. Yes. I never did eat witches fingers in the years of my youth. It was all about the normal candy like almond joy no bake bars, homemade peanut butter cups and paleo homemade twix bars. Everything that I currently know about all things spooky and Halloween-y COULD be a lie. I chose to be a blissful human and IGNORE that possibility. I mean, a life with almond joys and Twix isn’t really something to be mad about, you know? 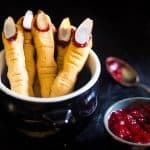 Besides the fact that they are soo0ooo0o00o scary and spook-tacular these gruesome, gory fingers for your cooking-munchin’-mouths are super easy. AND, for those of you that are concerned, taste NOTHING like a severed finger. Not that I know what that tastes like. JUST TO CLARIFY. They’re kind of like a shortbread in the sense that they’re more of a dry cookie. You know, the kind that go perfectly with your morning 10 cups of coffee? You’re picking up what I’m putting down. Plus they’ve got this nutty-sweet flavor from the almond extract that makes the inner why-can’t-I-eat-a-jar-of-almond butter-for-every-meal person that I am SUPER excited about life and everything that goes along with it. Like the easiest strawberry “jam.” That is not really jam at all, because you don’t need to slave it up in the kitchen for eleventy billion years playing with jars. This girl does NOT can things. Follow the chilling and freezing times. Hold it Cowboy. Don’t get all “wild wild west” (name that song!) on me and think you can just do your own THANG. Your fingers won’t hold their shape. Which will make you sad. And cry. IT HURTS. Resist the urge to cut the knuckles too deep. Then your cookies will crack in half when you remove them from the pan. See above points last two sentences. FROZENFROZENFROZEN strawberries. Not that you really want to buy fresh ones in October. Unless you don’t want your first born to go to college. That’s your choice not mine. 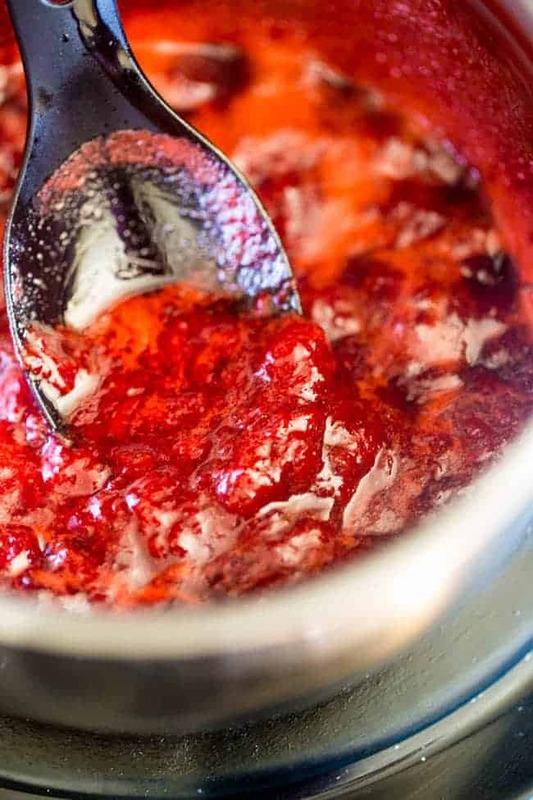 BUT, frozen are key to ensure that your jam has enough moisture to get nice and THICK. I love you guys even more than I love Halloween. Let’s get witchy with it. 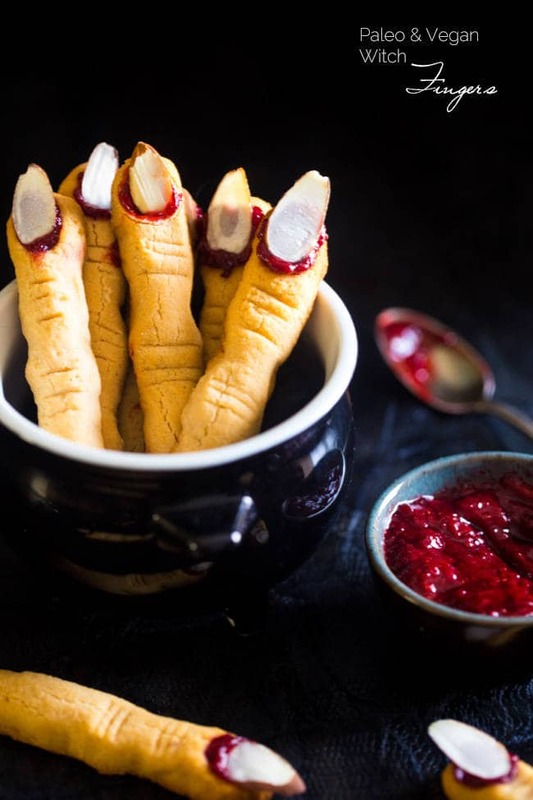 The classic witch fingers cookies get a healthy, gluten free, paleo AND vegan makeover! They're easy to make and always a hit at Halloween parties! 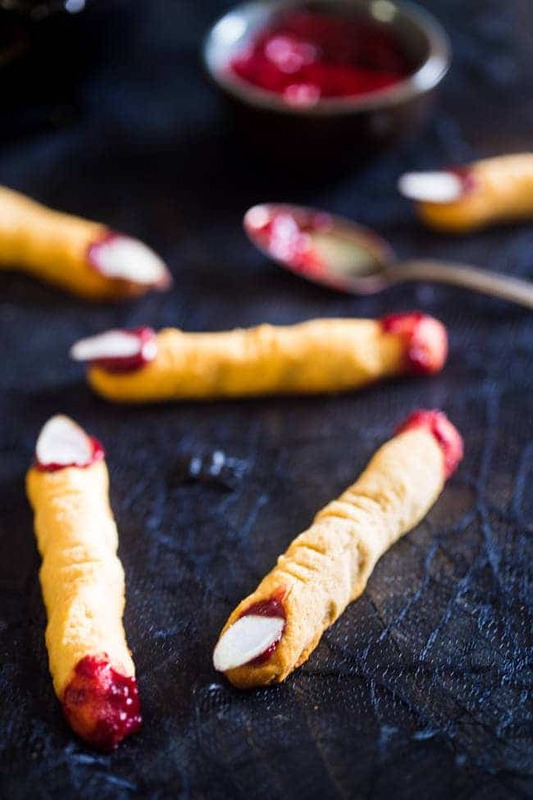 If you're looking for the vegan version of these witch finger cookies, see the * in the notes section! 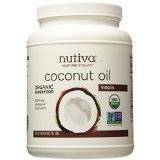 In a large bowl, using an electric hand mixer, beat together the honey and coconut oil and smooth and creamy. Add in the vanilla and almonds extracts and beat once more. Add the coconut flour and salt into the bowl and stir until well combined, and a wet dough forms. Scrape the dough onto a large piece of saran wrap and wrap into a flat, thin disc. Place into the refrigerator until firm and roll-able, about 25-30 minutes. While the dough chills, preheat your oven to 325 degrees and line a baking sheet with parchment paper. Set aside. In a small sauce pan, combine the chopped berries and honey and bring to a boil over medium heat. Cook the berries, stirring frequently, until they become very thick and smooth, about 13-14 minutes. Make sure to really keep an eye at them near the end of cooking time, so they don't burn. 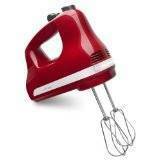 Transfer the berry mixture to a bowl and mash with a fork. Place into the refrigerator to set up. Remove the dough from the refrigerator and roll 1 Tbsp sized balls into 4 inch long finger-shapes, that are about 1/2 an inch thick. Place onto the prepared baking sheet and firmly press an sliced almond into the tip of the finger, to create fingernails. Remove the almond before baking. Then, using a small, sharp knife, make several horizontal, shallow cuts just under the finger nail, and then in the center of each finger, to represent knuckles. Lightly press in the dough on either sides of the knuckles to shape them. Place the whole pan into the freezer for 10 minutes. Once frozen, bake the cookies until golden brown, and lightly crackly (the cracks are normal, don't worry!) about 12-13 *** minutes. Let cool on the pan COMPLETELY. Once cooled, dip the bottom of the finger into the strawberry jam, so it looks like it's been cut off. Then, fill the finger nail space with a dollop of the jam, and press in a sliced almond. *You will only use about half of the jam, but it's hard to make a smaller amount with it burning. ***I found that using agave required a few more minutes of baking time, just 1 or 2 more minutes! 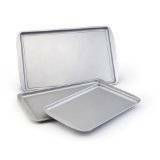 Store cookies in an air-tight container in the refrigerator. They will become crunchy, as the coconut oil will harden once chilled. Just let them sit at room temperature for a few minutes before serving, if you like a softer cookie. Haha. This post. 😀 I don’t even know where to start! These fingers look SO amazing. Good job on the knuckle cutting! I know it can be tempting to cut too deep in an attempt for extra creepy fingers. 😉 Loved all the tips, too! Haha YES! I did have a few broken fingers 😉 Thanks lady! My hubs is a huge fan of Halloween and even dresses up in a scary costume to hand out candy. 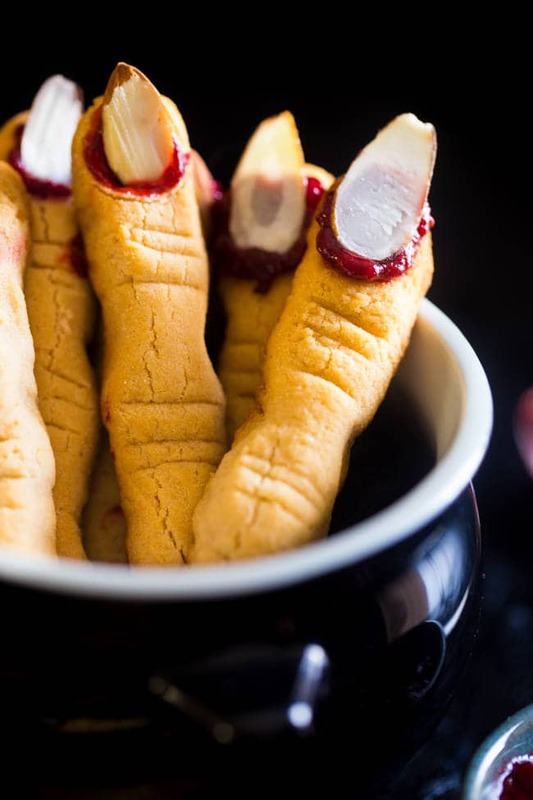 These witch finger cookies are so spooktacular and fun! Love that they’re paleo too! Love it! We do the same! Thanks girl! This is such a good idea for a healthier halloween treat! It actually spooks me out how much these look like real fingers! Haha isnt it the best! Thanks! 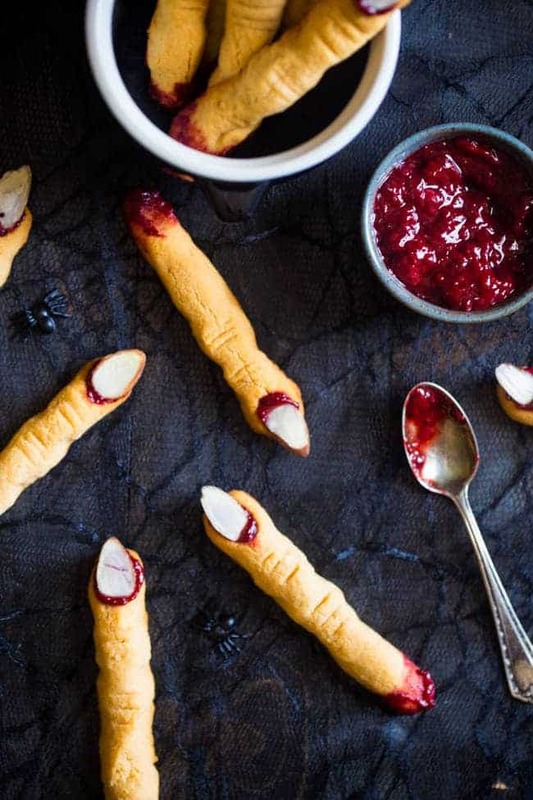 I live for cute halloween treats, so these witchy fingers are totally stealing my heart!! Pinning! I knew you’d be all over them! Thanks! Oh my goodness, these are genius!! These are seriously about the most genuine spooky edible things I think I’ve ever seen, they’re so realistic! You ROCK! YOU ROCK for being so awesome and making my day with your comment! Thank you Kimberly! These fingers are disgusting!!! Haha! Which obviously means you did a brilliant job! Wow, and they’re paleo too! Amazing! 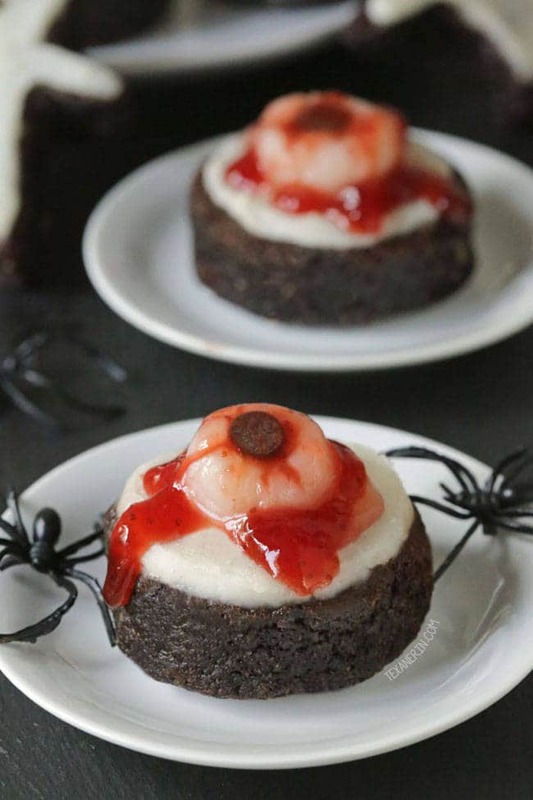 Great round up of healthy and scary Halloween treats! Good job, ladies! These are legit so cute! 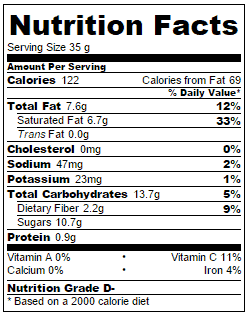 I love the ingredient list, no one would feel bad serving these to the kiddos!! You were so creative with this, I just love it! Right! It’s all about sneaking in something healthy with all that candy! Thank you Sam! First of all, I love Halloween. But i think you win. I can never think of anything clever to make. Lucky for me, I am friends with you and your genius self has got me covered!! Soooooo lovin’ these finger cookies! The perfect amount of spook per yum! Hallow-happenin’ in this house come time for trick or treatin’! Pinned! P.s. my parents totally gave me a pillow case to use AND “checked” my candy by taking half of it to eat for themselves! ‘Rents- a bunch of sketchballs I tell ya! I am SO glad we both had sketchball rents too girl! Thanks! Those fingers look creepy! And I bet they are delicious too! Well done! Haha, that’s the point! Scare them half to death and then console them with the deliciousness! You got it! 😉 Thanks Michele! OMG OMG OMG! Those witch fingers look soooo cool, it was such a mix of emotions as I burst out laughing at how awesome they are while also having an urge to eat them – even though they really do look like witch fingers. Am I a bit weird? Hope not. Hahaha you are not weird at all Teffy, I TOTALLY get you girl! I think I have the same reaction to them and I made them! 😉 Thanks! He HE He! Those fingers actually look gross (because they’re FINGERS! lol), but I know they taste AMAZING!! Nicely done – ha ha! Perfect for this upcoming HOLIDAY! Thanks chica!! Glad you approve! That is AWESOME!!! I LOVE Halloween…can I come? 😉 Thanks! Ahhh….so I secretly hate halloween because I’m so scared! Of everything! I can’t even watch TV this time of year because the commercials for the scary things freak me out. Big wimp right here. Sad face. These cookies are so fun! WHAT!!! NO that is so sad, scary movies are my jam! But thanks girl! 1. I SHOULD HAVE DONE THAT. YOU’RE GENIUS! All of these eyeballs and fingers are seriously creeping me out! Great Halloween roundup, very spooky! The witch fingers sound so clever! Yummy! Oh my gosh, these are the coolest Halloween treat I’ve seen yet! They look AMAZING!! You are the sweetest girl! Thank you! This does look cool! Totally psyched me out calling it vegan though! Honey isn’t vegan… Maybe I’ll try it with maple syrup or agave! Hi Vee! As noted in the recipe with the *the notes say to use agave for a vegan version as I know honey is not vegan! Thank you! Worthless recipe. This does not work! Don’t waste your time. The fingers completely melt and do not hold their shape. Wondering if there is anyway to add pb to the cookie mixture? It would be awesome to have PB&J fingers! ALso I’m a little nervous about using the coconut oil as I don’t often have much luck. The only comment on here says that they didn’t work out. I’m sorry, I really have no way of knowing that as the recipe wasn’t developed that way. I personally have tried this recipe MANY times and have always had success. It’s REALLY important to weigh your flour to ensure accurate results. I personally don’t think peanut butter would work, but please let me know if you try ir! That is SO weird, because I had multiple people Instagram their witch fingers over the weekend with perfect results. 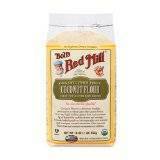 The only thing I can think of is did you weigh your coconut flour? This is KEY to making sure you’re using the correct amount. Let me know! That’s probably it! Dang it lol. I’ll try them next halloween, I guess. Thank you so much for replying, Taylor! Happy Halloween! No you can’t, they’re not interchangeable. Sorry!